Sometimes the truest of hard truths are to be found smack dab in the middle of the fakest of fake news. You just have to read between the lines. Take a recent story that bubbled up amid all the hype about the all-time record highs in the “What Could Possibly Go Wrong?” manipulated stock markets. You might have seen it. It was reported all over the usual MSM dinosaur fake news financial press outlets. Here’s the headline that the mother ship of the banksters’ fake news press, the Financial Times, ran with: “Nervous investors put the Bank of Japan in the spotlight”. And here’s the NY Times formulation: “Investors Spooked at Specter of Central Banks Halting Bond-Buying Spree” . And, perhaps most telling of all, this hot take from perennial market pimp CNBC: “Investors fear after Japan move the last of the global market ‘punch bowls’ are being taken away” . The global market “punch bowls?” That sounds like a Corbett Report headline, not something from CNBC. So what’s going on here? Well, the story is about the Bank of Japan’s (BOJ) recent decision to scale back its purchases of Japanese government bonds (JGBs). You may or may not know that the BOJ has been single-handedly propping up the Japanese bond market for the last five years by engaging in (in the characteristically blunt words of the banksters themselves) “Outright Purchases of Japanese Government Bonds.” These purchases have amounted to several trillion yen (i.e. several billion dollars) worth of bonds per month every month since 2013, a buying spree that has seen the BOJ become the largest holder of JGBs in the market. Then, as if that wasn’t enough, the BOJ actually promised unlimited bond purchases (literally whatever it takes to “calm markets”) last summer when word came that other central banks were starting to tighten their own monetary spigots. To be clear: This is not a change in policy. This is not an end of the BOJ’s JGB buying spree. This is just easing the foot off the gas pedal ever so slightly. And people are freaking out. So, in other words, the heroin might be in danger of running out sometime in the foreseeable future and the junkie is having pre-withdrawals. This is understandable. 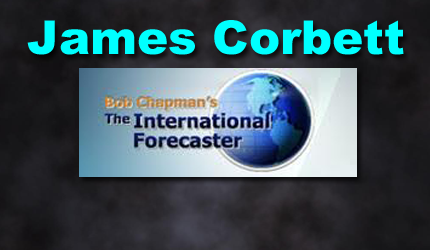 You don’t have to be a Corbett Report die-hard to know that the central banks have been behind the incredible decade-long bull run that has emerged in the wake of the Lehman debacle. Even the normiest of normies who only get their news from Yahoo! found out last year that a whopping 93% of that bull run was directly caused by the Fed’s intervention. “This point is not even controversial. It has been the universal consensus of institutions ranging from the Bank for International Settlements to the Official Monetary and Financial Institutions Forum, and from OECD officials to former Fed Governors and even Alan “Bubbles” Greenspan himself. And so finally, after our 10 year voyage through the looking-glass into economic wonderland, where bad news is good news because it means more central bank intervention, we now find ourselves traveling back the other way. Now good news (growing economic productivity, reflation, increasing optimism) is bad news because it means the BOJ and its bankster counterparts around the world are about to stop the carnival ride. Brace yourself accordingly. But is there anything deeper we can take out of this topsy-turvy journey? Perhaps this: the markets run on perception. When people believe the central banksters are willing to rain helicopter money down on Wall Street to keep the party going, they’ll invest and manifest that perception in reality. Markets will rise in response. When people believe the central banksters are going to take the punch bowl away, they’ll sell off their investments and manifest that perception in reality. Markets will fall in response. This is why the banksters call themselves the “Wizards of Wall Street.” It’s because they are performing magic. Magic in its non-mystical sense, that is: manifesting will into reality. The banksters can make the markets rise or fall, and believe themselves to be masters of the universe. Like all magic, it is an illusion. A trick. A sleight of hand. They get you looking at their jiggering of interest rates and buying of bonds to get you focused on a narrative that becomes self-fulfilling. “Don’t fight the Fed,” they say, and, because no one does, they usually end up being right. But the trick is that the banksters don’t have the power. You do. If you buy their narrative and follow their lead, you will bring their wishes into reality. And if you fight it, you’ll get steamrolled by the zombie hordes of Fed followers. The only alternative, it would seem, is to find your own path. One that doesn’t depend on the banksters and their rigged markets in the first place. Good thing I’ve talked about some of those alternatives in the past and will continue to talk about them in the future. In the meantime, watch for more bumps in the road as the BOJ and the European Central Bank and the Fed start to unwind some of the excess of the past 10 years. And look for the “madness of crowds” effect to take the stock markets in unexpected ways as people start believing in (and manifesting) the “Make America Goldman Again” stock market boom.